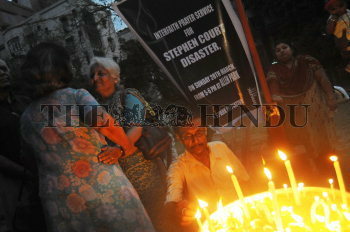 Caption : Kolkata: After fifth day of the tragic fire accident at Stephen Court in Park Street, Kolkata, the survived residents, friends and relatives organised a condolence meeting at Alien Park adjescent to the building on Sunday. People paid their homage to the people who were killed in the fire tradgedy by lighiting the lamp after the meeting. Photo: Arunangsu Roy Chowdhury March 28, 2009.